Skunk Berry is a great cross that brings together the skunks strength and stability with the fine blueberry taste. The plants are considered easy to grow and produce Christmas tree like plants that are stable and consistent. 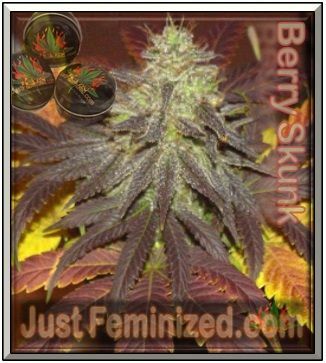 Berry Skunk Feminized Cannabis Seeds will grow fast with good stability and quick developing buds. With slightly lower temperatures towards the end you will see really nice colours coming through purple and Blue with lovely smells. The plants grow to a medium height finishing somewhere around the 120-150cm range depending on the temperature in your grow room. Buts will be dense and good yeilding with a THC Content somewhere around the 16%+ range. They produce extremely resinous and bulked out colas with a very berry-like aroma. Plants are best grown indoors but also do well outside. Indoor flowering can take just 8 weeks and you can expect good yields. Skunk Berry can be regarded as a good medicinal strain with a high Cannaboid level that has a strong relaxing effect on the mind, body and soul.